Based on Yossi Ghinsberg’s memoir, Jungle tells the true story of a man’s survival when he became lost for almost three weeks in the Amazon. It’s a thrilling tale, and amazing to know Ghinsberg managed to stay alive on his own, against all odds. 21-year old Israeli Yossi Ghinsberg (Daniel Radcliffe), has finished his mandatory military service, and sells his worldly possessions to fund the adventure he’s long dreamed of: exploring the Amazon rainforest. Leaving behind his safe future, he greatly disappoints his Holocaust survivor father who wants him to study law, and he departs Israel to chase his improbable dream in south America. For a year he journeys on a well-travelled path, but when he and two fellow adventurers he meets on the way, Kevin Gale (Alex Russell) and Marcus Stamm (Joel Jackson), meet the darkly charismatic Karl Ruchprecter (Thomas Kretschmann), and follow him into the jungle to find the Toromonas tribe, the dream soon turns into a nightmare, and Yossi is left in a harrowing psychological test of faith and fortitude, deep within the darkest jungle. With more than a eerie hint of Apocalypse Now’s Colonel Kurtz about him, Karl predicts that when the young men enter the jungle it will start to change them, and soon it becomes evident that their close-knit bond and loyalties are tested, amongst the challenging natural surroundings. Marcus’ gentleness and fragility – valued aspects of his character earlier – soon becomes a hindrance, and he suffers psychologically and physically. This then becomes a point of resentment for Yossi and Kevin, and they lose patience and sympathy for him. Running low on supplies and with Marcus’ suffering from his ripped, bleeding feet slowing them, they are forced to make a choice: decide to camp and trust Karl to leave and return with the Toromonas, or to turn back through the jungle without achieving their aim. The other possibility, though, which Kevin and Yossi vote for, is to get out by the river, and they build a raft and set off down it. But Karl seems to fear the water, and after a stressful first attempt afloat, they all part ways. Yossi and Kevin decide to stay on the raft, and Karl and Marcus disappear on foot back into the jungle. Yossi and Kevin seem to be making good progress on their makeshift boat, but are soon separated by the brutal force of the rapids, Kevin making it ashore, but Yossi pulled underwater, downstream. This is where the film takes a very dark turn indeed. Where at first it seems like a fun adventure for these young men, now that Yossi is left alone, it becomes a grim, extremely tense experience watching him reduced to a raw, vulnerable core, struggling to survive. We see Kevin being picked up by local people, soon after, but Yossi is in peril, and for the next 19 days, whilst losing his mind and facing extreme physical and health challenges, he’s clinging to the hope that he might be rescued, deciding moment by moment whether to perish or cling on for survival. It’s an incredibly gripping tale, the suspense and terror made more so by the knowledge this is a true story. The filmmakers worked closely with Ghinsberg, who was on set the whole shoot, to ensure authenticity in the narrative and Radcliffe took regular advice from him about where Yossi’s mindset was, throughout the story. The location of the shoot (rainforests in Colombia and in Australia, doubling for Bolivia) clearly presented practical challenges to both crew and cast: none of it was shot on green screen, and the stunt work and cinematography, alongside tight direction, is excellent. 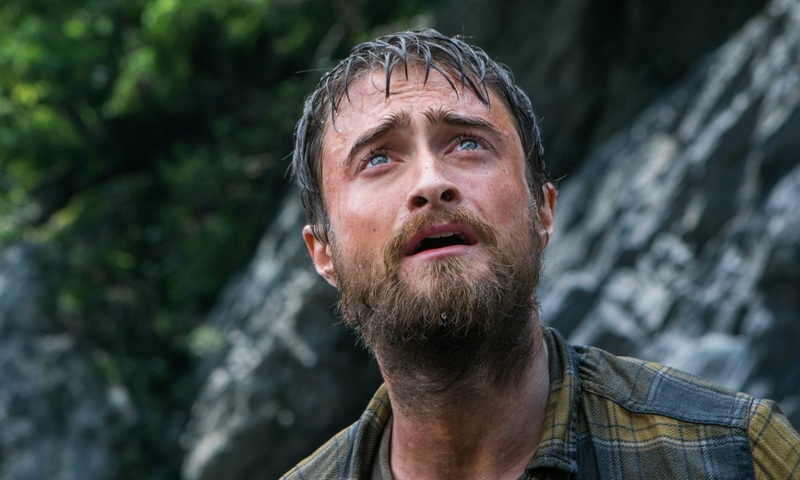 All the performances are noteworthy, but Radcliffe’s portrayal of Yossi’s terror and desperation, alongside his determination to live, makes Jungle a compelling watch indeed.